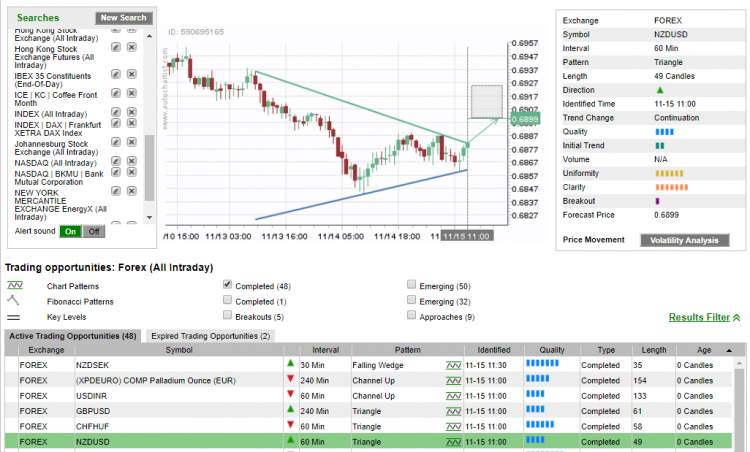 Autochartist is a powerful tool that will allow any trader to anticipate and react to the elements of trend, support and resistance which form the basis of chart pattern trading. To best navigate the Autochartist web based platform and get the most from the automated trading opportunities are a few key areas of the interface to get to know first. Below is an emerging pattern alert found in the results column. Emerging patterns allow for a proactive trading approach as patterns are signaled before price action pierces either the support or resistance lines of the formation. There are also some very important Quality Indicators that will further confirm or filter results depending on the pattern type, trend, and price action. This removes much of the subjectivity in chart pattern trading and allows for unbiased trading. The first thing to note is that this NZDCHF alert is on a 15-minute intraday time frame. This can be seen on both the alert line and the chart itself. Autochartist scans across the 15, 30, 60, 240 and 1440-minute time frames. Therefore, this 15-minute chart represents the shortest time frame that Autochartist will alert pattern results for. The pattern type is also listed on the chart, as well as the potential direction of the pattern break. A Falling Wedge is a trending pattern. This Falling Wedge is an up trending pattern occurring on the short term intraday chart of NZDCHF. The Initial Trend reading will help confirm the strength of the current trend. For a trending pattern to continue it is best if the Initial Trend reading is 6-bars or greater. The maximum reading is 10-bars. As can be seen in the example the reading is 3-bars, indicating sideways volatility. However, one more bar would signal a transition to a trend. The Initial Trend reading will be one of the most important Quality Indicators within your pattern filtering process. To reiterate, emerging patterns are proactive trading opportunities, and completed patterns are reactive and trade management opportunities. The filtering process is important in obtaining the most from the trading opportunities which stream throughout the day. Each trader must understand the set of criteria associated with aggressive to conservative entries. The completed pattern trading opportunity for NZDUSD was on a 60-minute time frame. 2. The Forecast Area which will automatically be plotted on completed chart patterns. There are times when emerging patterns will show a break of the pattern. This is due to the fact that Autochartist updates price on a 15-minute chart every 15-minutes. The Breakout reading offers insight into the momentum with which the pattern broke the resistance line of the Triangle pattern. As can be seen the Breakout reading is very low at a minimum of 1-bar. This is an indication of weak momentum as prices break higher and in turn creates a low expectation of an immediate follow-through. Remember if the pattern breaks before an economic event or before the opening of a financial center like Sydney or New York, there could be significant follow-through later. The completed patternt shows a grey Forecast Area (outlined). This level is resistance as it’s plotted above the price breakdown. The Forecast Area offers guidance to traders for trade management which makes completed patterns valuable once an entry is taken.